There are no easy answers in Safe. When Carol (Julianne Moore) begins to start experiencing violent allergic reactions to an unknown stimulus her doctor is both clueless and unsympathetic. He tells her she is making herself sick and passes her on to a psychologist who tells her much the same thing. But as Carol’s condition gets worse and she starts vomiting, having nose bleeds and fainting she begins to suspect that the actual cause of her illness is her environment. Everywhere she sees chemicals; in car exhaust fumes, in the perfume bottles on her shelf… the entire world seems against her as she desperately reaches out for help in this revisionist paranoid thriller. When you first sit down to watch Safe you incorrectly assume that you have this one figured out. It seems pretty clear that the film is taking up a stance against pollution and the 20th century’s reliance on artificial chemicals, but the film isn’t as black or white as that. There’s a healthy mixture of allegory and biting social commentary on display here which not only widens the scope to include disease more generally, but which also seeks to open up a discussion on the human condition and our fear of loosing control. What’s particularly pleasing is that it sets about doing this in ways which are both unexpected and thrilling and which I won’t spoil here. 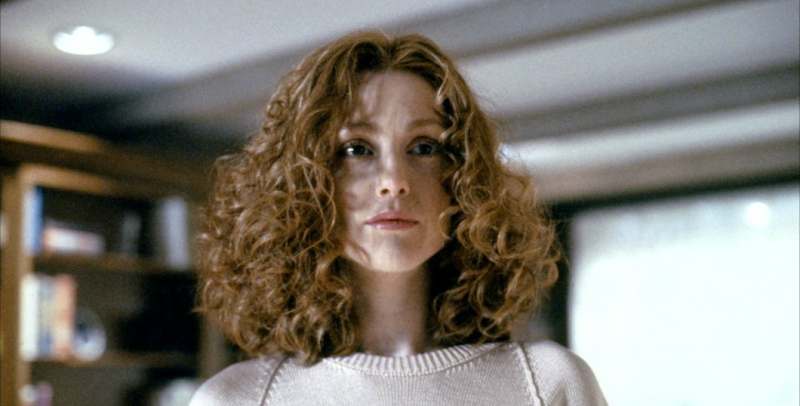 One of the most impressive things about Safe is Julianne Moore’s performance. Unlike several of her roles in the past which have called for her to break down in quite a noisy and uncomfortable fashion, here she plays Carol as an extremely weak and waif like woman whose approach to life is so uncomplicated and perhaps even unintelligent that it’s no surprise how quickly she succumbs to this disease. She lives in a sterile house, with a sterile marriage and a sterile world view. She can’t manage to summon the ability to have a meaningful conversation with anyone and she seems to have already disintegrated socially and physically before the disease even strikes. This woman then would fade off the screen if it weren’t for the quiet powerhouse performance by Moore. She somehow manages to rivet our attention on this wilting flower, summoning pathos out of a seemingly depthless character. It’s an impressive performance to behold and when combined with Haynes’ writing it raises the film into an emotionally and intellectually complex arena. It’s such a joy to watch a film which truly challenges its audience. Which doesn’t preach on one social subject but instead throws many into the air and then refuses to align itself with any one viewpoint. Instead it leaves us with an uncomfortable but well controlled mess of topics to think through and debate long after the film has ended. 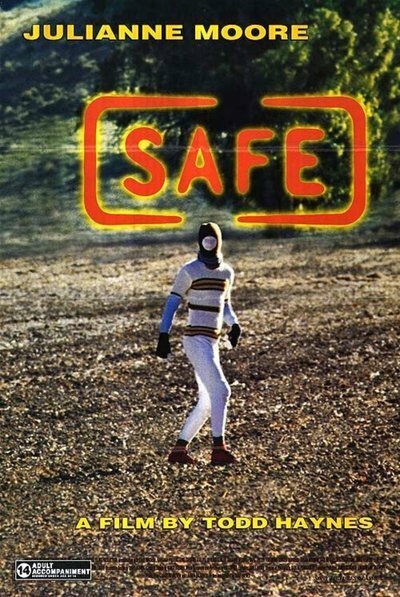 Safe may be too slowly paced for some, but it’s an attribute which I think is key to the film’s unnerving edge. What could be improved is the script’s structure which feels a little unbalanced, the film perhaps spends too much time in its first half and slightly too little in its second. However the structure winds up as being quite a minor complaint in the grand scheme of things for this is one of the most interesting and subtly chilling thrillers I have seen in years. In fact it’s quite possibly one of the best films of the 90’s, and is one which certainly deserves to be seen twenty years on. What is the film’s greatest strength? Moore’s performance. Its greatest weakness? The structure felt a little off. The slow pace was very effective but I think the first ‘half’ was a little too long in comparison to the second. Would I see it again? Yes, it’s one which will haunt me for a while. I love Julianne Moore but have never seen this film. Sounds like I should correct that after reading this review. You certainly should! It’s one of her many excellent performances. Thanks for the recommendation, Moore is just incapable of giving a bad performance. I’m definitely going to watch more of her movies to review for my blog. I look forward to reading them. I want to watch all of her work but she has a fair few films under her belt. Exactly, I didn’t realise how many movies she has been in and how many talented movie makers she’s worked with. She has found a great balance between doing commercial projects and interesting indie projects as well as everything else that lies in between. That’s a perfect way to summarise her career, she just has a knack for choosing good roles. That or she at least always brings something worthy to them. I think it’s a mix of both. ← Exclusive Interview: Valentina Fedonos Talks Turning Point!